Wow. That’s just the feeling that came to me after sitting down with the folks over at Samsung a few days ago during a meeting in New York City. We all know that they’re all about innovation and driving technology to new places, but we weren’t expecting to feel such a deep, long lasting impression with the company’s latest wearables – the Gear S2 and Gear S2 Classic. After toiling and perfecting the craft, it looks as though Sammy has finally nailed it – and boy are we all in for something cool. Samsung has been in the modern day smartwatch business longer than most would credit them, establishing their presence as a premier player in the space with the original Samsung Galaxy Gear, which interestingly enough, was announced just a couple years ago in September 2013. Time surely flies! This has the best smartwatch design to date! That’s not an overstatement because after holding the Gear S2 in our hand, then proceeding to wear it, we’re just mesmerized by the futuristic appeal of its all metal sci-fi styling. Seriously, it looks like something from the future, but it’s here in reality. Minimalist in nature, yet elegant in appearance, this thing looks and feels good on our wrist. Going with the round face style, it’s nice to see that its size is proportionate enough to prevent it from being too bulky looking. For Samsung, this is undoubtedly a victory for them, just because their smartwatch designs haven’t been all that flattering. Remember the protruding camera with the original Samsung Galaxy Gear? 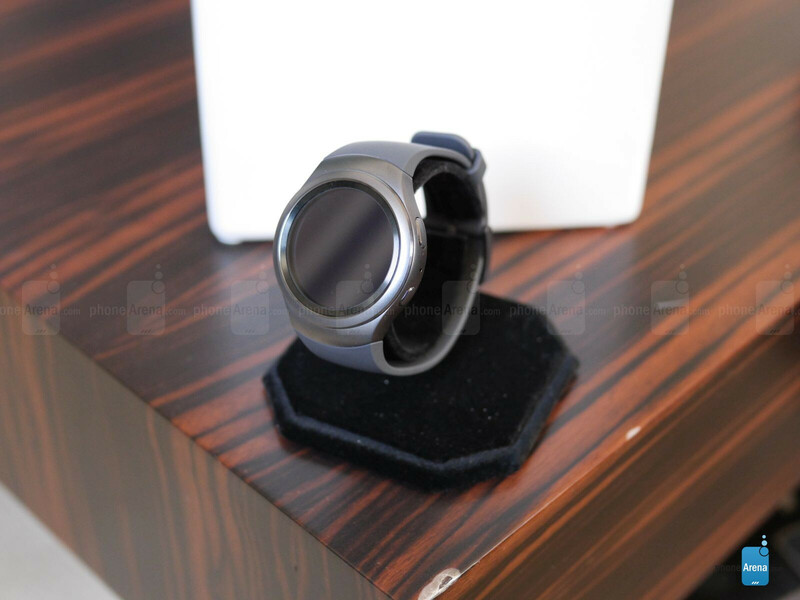 Or how about the elongated and massive size of its most recent offering – the Samsung Gear S? Similar to how they’ve redefined themselves by introducing a ground breaking new design with its flagship phone, the Galaxy S6, Samsung is doing the same here with the Gear S2. The bands connected to the Gear S2 are your typical clasp, relying on that good ‘ol fastening method – where it’s able to accommodate a wide array of wrist sizes. If you have tiny wrists, however, the bands might seem to overlap too much. Sure, they’re the rubbery elastomer material that’s great at staying clean and dry during workouts and whatnot, but on the flip side, it doesn’t give the smartwatch any sort of premium quality. To that effect, it actually exudes more of a sporty-casual style than anything else. Despite that, replacing the bands is a snap because they’re fastened on using this quick release mechanism. Simply, you just slide the clasp and off it goes! Two buttons are fashioned onto the right side of the Gear S2, the upper one is used as a back function – while the other jumps us back to the homescreen (watch face). Rounding things out, there’s a heart rate sensor on its underside used to measure our pulse, and alternatively, it’s used as a security measure to know if the Gear S2 is being worn or not. Thus far, most smartwatches rely on the touchscreen for navigation. Apple, most recently, popularized the notion of using a crown as yet another way to navigate and interact. Samsung, on the other hand, opts to go with a unique spin with the Gear S2 by employing a rotating bezel around the display. Our biggest concern heading into it was the rotating bezel, whether it was going to be too sensitive or unresponsive. Luckily, Samsung did it just right by offering enough fluidness with its operation. When rotating the bezel, it’s accompanied with a little bit of ‘locking’ mechanisms as it’s being rotated smoothly clockwise or counterclockwise. Naturally, it’s a convenient way of moving around its Tizen based interface – and it exhibits just enough responsiveness without being too sensitive. Swiping over the display is one thing, but we really enjoy the satisfying movement of using the rotating bezel as well. Armed with a 1.2-inch 360 x 360 Circular Super AMOLED display, it’s certainly quaint in size in comparison to the round displays on some other smartwatches. For example, the larger version of the Moto 360 is accompanied by a 1.56-inch display, while the Huawei Watch comes with a 1.4-inch one. Regardless, we like its size and definitely takes equal precedence to the Gear S2’s overall design. Being Super AMOLED, you get that perfect black color reproduction, so when it’s displaying a watch face, it can sometimes appear to be mechanical – albeit, we know that we’re dealing with a digital one of course. Of course, it exhibits pretty much all of the qualities of AMOLED technology – like its wide viewing angles. Colors are surprisingly neutral in tone in our quick look, as opposed to being over-saturated. And even though we’re able to visualize the screen in decent lighting indoors, we’re really curious to see how it stands up to outdoor visibility. Considering that they’ve perfected the art of making Super AMOLED display with incredible characteristics, we have full faith that it’ll be more than usable in that particular setting. And oh yeah, placing your palm over the display turns it off. One of the biggest concerns going into something like this is the Tizen interface that’s used to propagate the experience. Anyone familiar with Samsung’s past Gear offerings will notice how this one is influenced by them. For example, apps like the calendar and weather look like they’ve been ripped from its previous smartwatches. Still, the rotating bezel is optimized to work in conjunction with what Samsung calls the “rotary” UI. Basically, some of the core apps and functions of the Gear S2 are accessed by either using the rotating bezel or just swiping on the touchscreen. Honestly, every action is accompanied with an instant response, so using the rotating bezel for navigation is just as effective as the touchscreen. Of course, there’s also the concern regarding the diversity of apps with the ecosystem. There’s nothing to be alarmed about at the moment, just because Samsung ensures that there will be over 1,000 apps available at launch. We even managed to check out a couple of them in our meeting, such as Uber. Using the Gear S2, it’s able to request an Uber ride to a specific destination – showing the route on the Gear S2’s display. And interestingly enough, all the apps are run natively through the Gear S2, so there won’t be any nagging issues about how some other smartwatches are faced with latency issues trying to access data on a smartphone. As of right now, Samsung says that the Gear S2 is compatible to work with most Android 4.4+ devices with 1.5GB of RAM. Certainly, that can be viewed as a limiting thing, but we can imagine that wider support will be available down the road. Hey, we’re hoping to see expansion into other platforms – like iOS and Windows. Under the hood, it’s powered by a dual-core 1GHz Exynos 3250 processor with 512MB of RAM. Its performance is actually better than some Android Wear smartwatches too, which goes to show the kind of optimizations brought on by the processor or software. Internally, the 4GB of internal storage suffices for many folks, as it’s the usual capacity we’re commonly seeing nowadays in high-end smartwatches. 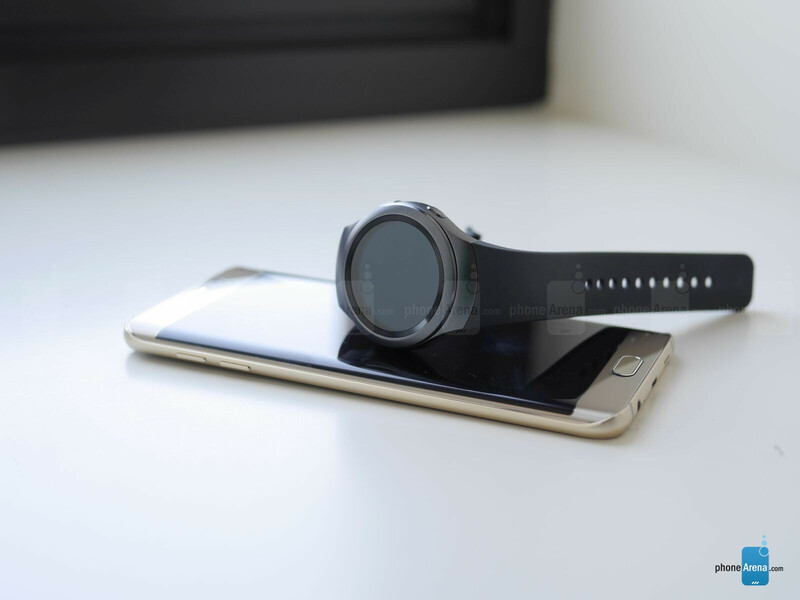 In addition to the Bluetooth option, the Samsung Gear S2 offers exclusive Wi-Fi connectivity as well to receive all and any notifications. Being untethered from a phone is a good alternative, but of course, it’s always there if you choose to stick with it. And yes, it comes with built-in NFC that will be used in conjunction with Samsung Pay. We’re told that we can use the Gear S2 independently, without it being connected to a phone, to make payments using Samsung Pay. 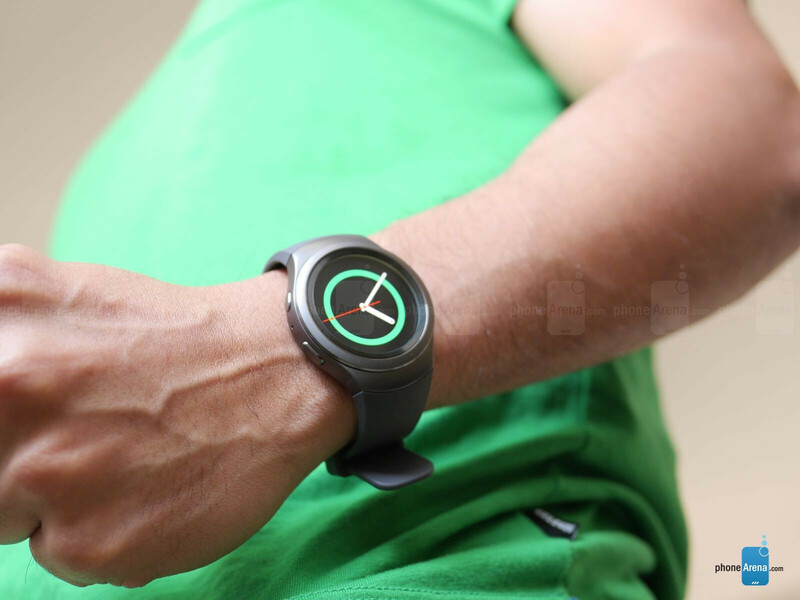 Lastly, there will be a version of the Gear S2 with built-in cellular connectivity to offer true, independent operation. Wow. We really can’t stop telling ourselves that. Samsung has finally nailed it with the Gear S2, showcasing how a smartwatch can be used as wonderful companion. From its cool and futuristic design, to the unique way of navigating via its rotating bezel, to the smooth operation and execution of its Tizen platform, the Samsung Gear S2 is kicking things off by running full strength on all cylinders. It’s cool, it’s hip, and it’s undoubtedly one of the most astounding smartwatches to come in recent memory. While pricing hasn’t been disclosed, we’re told that availability in the US will start in early October – with carriers making announcements soon after that. The biggest deal breaker, not surprisingly, will be its final price. Right now, the competition removed the veil from its offerings, so it’ll be interesting to see how Samsung will proceed knowing the price points of its main rivals heading into the upcoming holiday season. Obviously, the $350 price point seems like a good target, so let’s cross our fingers and hope that’s the case. Between this and that new flip phone, Samsung really has my attention right now. I can't believe they made it work on Android devices with 4.4 and above (not just Samsung... did not see that coming. Bravo for openness! .... they did say that right? Yeah they did. If they had did that from the beginning with the first Gear, more would have sold. I don't mind exclusive devices from a brand that work seemless with brand products, but; in this case since Samsung phones run Android, I never understood why they didn't make some of the wearbles work with other phones. So kudos to them for do this. We will see if Cupertino follows suit. This basically shuts every other smartwatch down. Rotating bezel with touchscreen and you can use it on any android phone... Day one purchase for me. They really innovated on this! This indeed seals it for me as well. Day 1 purchase! What's missing? I have the Gear S as well. I will surely get a Gear S2 for sure, but the Gear S has everything all other wearables were missing, like its own connectivity for calls and internet. The only thing missing is style. I think the Gear S was more of function since the other gears had some style. Now we have both. Don't get me wrong I like it but it was something with the UI... Just didn't seem polished enough... Now look at the S2's UI, It's very polished and multi platform ready. Even without the rotating bezel you see the upgrades to the UI. That's what was missing for me. Smartwatches..how is it I never seem to get what all the buzz is about? Day 1 purchase for me, this thing is amazing! A moment of silence for other smartwatches. Yes Gear S2 is open to all Android phones (4.4 ver, 1.5GB ram), and its going to make this the topseller among android smartphone manufacturer's offerings. Looks too girly for my liking. I want a watch with a good thick metal bezel. +1 for Android support and not just their brand. The Samsung fanatic said "The best looking smartwatch". It's more like the most futuristic smartwatch to date. Nothing casual or modern about it. The best looking smartwatches are listed below: Moto 360 (First Gen) Asus Zenwatch LG G Watch Apple Watch Moto 360 (2nd Gen) The Samsung Gear S2 looks like the feminine version of a males watch. Who in the heck are you to tell someone that they're wrong about something that's clearly an opinion? Get out of here, child. Exactly but... we know this isnt the best looking . That's child abuse! Where in the heck did you read he said what you said. He said something totally different than what you said. Samsung gear 2, s2 or whatever doesn't even make my top 5 list. Moto 360 2 is still the WINNER. For me. My opinion. Don't get mad, abuser. Lol sorry but it's clear the two best looking smart watches are the Huawei and the S2 Classic. Your list is a joke, especially since it includes the new Moto and the Apple watch. Those two are just tacky and disgusting. Lol Apple watch is the most feminine watch ever made btw. Actually the Samsung Gear S first had a great looking for me. Samsung really hit it out of the park this year. Between the GS6/edge and the Note 5 and now this. They killed it. Even the Tab s2 is fantastic despite the bad press. Performance and build on that tablet has been great. Besides not using the Exynos 7420 on the Tab S2, they killed the rest IMO.